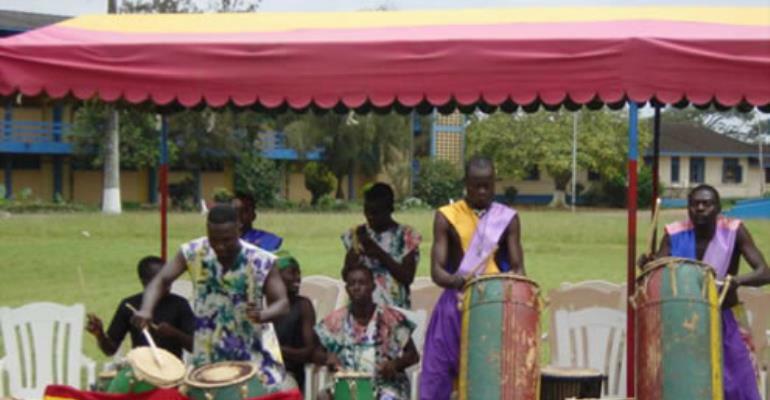 A ceremony at the Gbese Mantse Palace in Accra, to lift the one month ban on drumming and noise making on Thursday turned out to be political arena for the two main political parties, the New Patriotic Party (NPP) and the opposition Party, National Democratic Congress (NDC). The ban preceded the Homowo festival of the Ga people, which falls on August this year. It was impose in May this year so that the chiefs, elders and people could fast and pray for rainfall and abundance of food. Thereafter, the NPP officials arrived with a motorcade announcing the presence of the regional Minister, Sheikh Ibrahim C. Quaye. Other officials who accompanied the minister included Nii Adjiri Blankson, Mayor of Accra metropolis and Reginald Ayi-bonte, Member of Parliament (MP) for Odododiodioo, Mr Jake Obetsebi Lamtey, Minister of Tourism and Modernisation of the Capital City amidst shouting and dancing as they went round to greet chiefs, elders and people. As the officials retired to their seats at the dais waiting for the performance of the rites for ceremony to start, there was sudden noise from the roadside announcing the coming of the former President Jerry John Rawlings and his entourage, including the flag bearer of the party Professor Evans Atta Mills. Immediately after their arrival, at the palace they were led to the upper room to pay homage to the chiefs and elders managing their way through the thick crowd. People's attention was geared towards the former President, and they shouted J.J.J.J, Second Jesus and waved party umbrellas and scarves. Even though security was beefed up, it was difficult to control the large crowd who wanted to catch a glimpse at the former President as he came down to take his seat close to the daize of the government officials. The pouring of libation is normally done in a serene atmosphere but at this occasion even the chief priest of the Gas, Numo Tete III, Naa Wulomo, was being pushed and no one could witness or hear what was going on, as the whole place was noisy. However there was drumming, dancing and intermittent gunshots to signify the lifting of the ban after the pouring of the libation. To the amazement of pressmen and the crowd none of the officials from both parties spoke and the ceremony ended abruptly.